"I can only handle so much change." Nine months have passed, and our characters have been trying to find themselves. It's a nice parallel that the show is clearly trying to do the same. The good news is, I still love Tom Mison's Ichabod Crane with all my heart. There's something magical about the combination of the actor and the character, and I don't think I'll ever get tired of watching him just walk and talk. Complaining about customs enforcement. Telling his woes to his prison cell-mate Jesus. Letting loose with major sarcasm in a colonial-themed restaurant. Smooching with Betsy Ross, secret agent and scout extraordinaire. And of course, hanging with our heroine Abbie Mills and her marvelous sister Jenny as they fight evil. Which just came to town in the form of Shannon Sossamyn as Pandora, who even has her own magical Box. What is she? Old, of course. Powerful, certainly. Evil, obviously, since she just dissolved the Horseman of Death (not to mention the horse!) and put him in a box, and then followed that up by conjuring up a battlefield demon. She also has cat eyes, seems to be into nursery rhymes as incantations, and she said that the box was a dowry. A dowry? Who is she planning to marry? And was she watering a dead tree in that underground cavern? Is Pandora related somehow to the tablet that Ichabod found in his own burial vault in Scotland? The one entitled "The Legend of Sleepy Hollow" with the picture of the two Witnesses and the word "Destroyers"? And was anyone else thinking of the angel and demon tablets on Supernatural? Our other new character was Betsy Ross (Nikki Reed), who was General Washington's most trusted operative. Could be fun. Is Betsy going to be a focus for the Colonial flashbacks instead of free range founding fathers, a partner for Ichabod in the past as a parallel to his current partnership with Abbie? Are they really going to make it romantic? Ichabod was always faithful to Katrina, though. When did Ichabod get involved with Katrina? If Betsy doesn't work out, at least we have Jenny Mills, who was a lot of fun in this episode. She threw herself into the fight like it was her purpose in life. She'd obviously been immersing herself in the archives, in between working as a paralegal, serving drinks, and getting Frank Irving into "witness protection". It's too soon to know if this rebooty-type thing is going to work. It does feel a bit like they're flailing around, trying to reestablish the season one show mythology that was pretty much abandoned and circumvented. Maybe the magic of season one isn't retrievable. 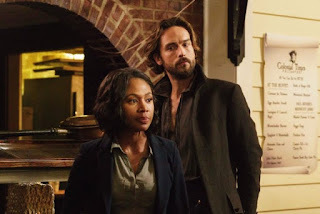 And maybe it's enough that we have Ichabod Crane and Abbie Mills as partners again. We'll see. I'm certainly willing to keep watching. Maybe this "second tribulation" thing will work out. -- Half the cast is gone. Orlando Jones, Katia Winter and John Noble are out of the credits, and Nikki Reed and Shannon Sossamyn are in. -- The archives are scheduled for demolition. We can't have that. Where will our characters hang out and do research? -- I really liked the 1775 Bunker Hill revamping of "Don't fire until you see the whites of their eyes." -- Also liked the immense bobblehead of Benjamin Franklin. And the Boston Tea Party set. -- The brief scene where Ichabod removed his prison orange and donned his original clothes was great. I really do love this guy. So did "Miss Dani" the lab woman. -- Blueberry stout? Gag. Apparently it's made by "Dark Horse." That's appropriate. -- In this season's hair report, even though I miss the ponytail, I love Ichabod's new hair. Is that Tom Mison's own, I assume? A couple of hours less time in make-up? I also liked that Abbie's is shorter, like Ichabod's. It's a fun little thing that our two witnesses seem to have the same hair style. Abbie: "You want to stay with your new pals?" C-Dawg. The prison stuff was great fun. Ichabod: "It was only then that I gleaned what they meant by 'return to your upright and locked position'." Abbie: "Crane on a plane. I miss everything." Ichabod: "This tablet could hold the key to our mission as witnesses." Abbie: "Our mission? For all you know, this is Sumerian Sudoku." Ichabod: "That is precisely the use of centralized federal power that Thomas Jefferson warned against." Ichabod: "The deeds of so many brave men and women, signposts of history, reminders of our hardship and the ultimate sacrifice. They've taken it and used it to decorate an eatery." Abbie: "They also have mini golf out back." Colonial Times host: "Hath thou dinest with us before?" Ichabod: "Why are you talking like that?" Ichabod also moved the host's tricorne hat so that the corner was in front. I never realized that pirates wear their tricorne hats backward. You learn something new every day. So what do you think, SleepyHeads? Are you ready for Apocalypse 2.0? Well, I decided to give the “reboot” a try, and it did okay for me. I wasn’t keen on the Betsy Ross stuff --- that’s a lot of cleavage for a gal who’s supposed to be flying under the radar as a spy --- but the rest worked fairly well. I actually enjoyed the Crane-Mills partnership again! I think giving them an in-show breather, but making their reconnection really easy and friendly let me ease back into their vibe on good terms, too. And I was mildly intrigued by the “modern day” version of Pandora at the end. I’m in for another week at least. Who's a little fear demon? LOL. Loved the cleavage comment, too. Don't taunt the fear demon! "Why? Can he hurt me?"